The Church of St Giles without Cripplegate sits, as one of the few remaining London medieval churches, in the midst of the 20th century Barbican, close to an exposed section of the old Roman wall. It is believed that a church has been on this site for over 1000 years. The name Cripplegate has nothing to do with cripples. It is derived from an old Saxon word "cruplegate" which means a covered way or even a tunnel which ran from the city gate to a fortified watch tower, the Barbican. The church was outside the confines of the city wall, hence the term "without" in its name. Parts of the medieval church remain visible in the chancel area. It is a church steeped in history and the burial place of John Milton, who was a parishioner. Although spared in the Great Fire of London in 1666, the church was damaged by the Cripplegate fire of 1897 and then devastated by incendiary bombs in 1940, together with large areas around it to the north. The area became popular after the War for walks along the remains of the walls on weekends, right up to the shell of St Giles which was all that remained of the building. At that time, there were no plans to rebuild the church. St Luke's Old Street had been built after the establishment of the parish in 1733 to relieve St Giles which was too small to accommodate all the congregation, and since by then the congregation of St Giles had been decimated it made sense for St Luke to take on the role as the main church of the parish. However, in 1959 St Lukes was closed on discovery that it was structurally unsound. The oak piles which formed the foundations of the building were found to have rotted away. Oak is in fact remarkably stable and can last indefinitely, provided it remains either dry or wet. With the dropping levels of the water table in London, the oak had dried out, leaving the foundations crumbling away. Almost overnight, the church was closed and much of the furnishings were removed. Such were the fears for the integrity of the building that all the windows were removed in case any difference in air pressure inside and outside the building caused it to collapse. In the end of course, after lying derelict for many years, St Luke's has been restored and is now the LSO education centre. St Giles had by then been rebuilt, making use, in part, of the plans which remain in Lambeth Palace for the reconstruction of the church after a fire in Henry VIIIs reign. The organ on the west gallery was built by Noel Mander using much of the material salvaged from St Lukes Old Street. As well as being a parish church, serving the city during the week and a congregation from the nearby Barbican and further afield during the weekend, St Giles is home to the St Giles International Organ School. This unique and ambitious venture launched in 1992 now has 14 teachers offering instruction to over 300 students annually. In order to further the activities of this organisation and to enhance the already vigorous life of the church, it was decided that two additional organs should be built. One of these is the new two-manual organ at the east end of the north aisle. 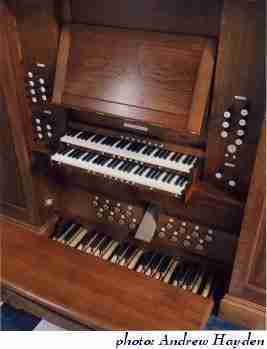 This second organ in the church is intended to complement the larger three-manual instrument on the gallery by being more modest, with a sensitive key action to enhance the teaching and practising activities of the St Giles International Organ School. It is also intended for use with smaller services and the many occasions when choirs and orchestras make music in the chancel. Whilst modest, the organ had to be as flexible and versatile as possible. It has 13 speaking stops, two of which (the Great Open Diapason and Trumpet) are borrowed mechanically onto the Pedal Organ. The tone is relatively bold for such a small instrument and fills the church surprisingly well. For some considerable time now, we have been trying to find a suitable situation to build a so-called serpentine or Ogee case. Here at last came the opportunity. Being more articulated than usual adds interest, although setting out the complex curves and fitting the carving becomes a task in itself. The result, though, is worth the effort, reflecting very similar designs used by English builders in the 18th century, particularly in London. One of the aims in building this organ was to make it as accessible as possible to disabled people, especially the visually impaired. To this end the instrument has some unusual features. The shanks of the stop knobs have raised rings to assist blind organists to identify whether the stop is a principal, flute, mixture or reed stop. The music desk, which is endowed with rather more lighting than usual, is also adjustable, and a multi-function toe piston was included which can be selected to be a Swell to Pedal reversible, stepper advance or retard. In order to enhance the use of the organ for teaching and practice, it has more pistons (including the stepper facility) than one might expect on a small instrument such as this. But the most innovative feature must be the speaking stops facility due to be installed in the autumn. This has been developed by Matthew Fry, the Mander Organs electronics wizard. When engaged, this speaks the name of any stop drawn or put off, any piston which is pressed, it identifies which function has been selected on the multi-function toe piston, which memory level has been selected when the scrolling button is released and at the press of a button will read out the names of all the stops which are currently drawn. We believe this is the first time such a feature has been incorporated in an organ in the UK. Details of the carvings on the east organ is here. A regular feature of our more recent instruments is to add interest to the carving. We often try to include elements which relate specifically to the church, its history and sometimes the history of the location or biblical themes. The same has been done here and you can read about the pipe shade carving for the St Giles instrument here (see, inset, right). The key action is suspended as the internal layout of the organ suggested this form of action as being appropriate. To offer a further contrast to the main organ, the pedal board is straight concave and it is tuned to Anton Kellners modern unequal temperament which has fifths tempered by one fifth of a comma between C, G, D, A and E and between B and F#, the remainder being pure. The Swell tremulant is of the Dom Bedos type with a flap in the trunking controlled by a spring with a weight on the end. We like these tremulants as, whilst sometimes tricky to get to work properly, they are slightly uneven in their operation and react differently depending on how much wind is being drawn through them, so they are more musical. The organ was opened by Thomas Trotter with a wide ranging programme on 1 April 2008 which was reviewed by William McVicker in Choir & Organ, July/August 2008. 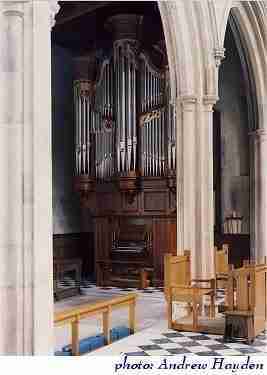 View the Specification of Organ in St Giles Without Cripplegate (completed 2007) and pipe scales.